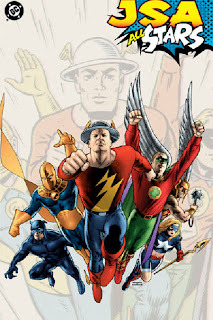 Well, I will say for JSA: All-Stars, if you're a fan of any of the writing-and-art teams involved, there's a lot to love in this book: Jeph Loeb and Tim Sale on Hawkman, Darwyn Cooke on Dr. Fate, Brian Azzarello and Edward Risso on Dr. Mid-Nite, Michael Lark with Michael Chabon on Mr. Terrific, and especially James Robinson and Tony Harris on Starman. That is, it's great to see these teams in action ... but if you're looking for the characters written by these teams to be in-character, go somewhere else. Sure, Dr. Fate is his typically overblown self, and Robinson literally wrote the book on Starman, but in most of the short stories, the characters themselves are nearly interchangable. And don't go looking for much more in the main stories. Some of these do indeed add to the characters' backstories--Hawkgirl, mainly. That the Star-Spangled Kid is redubbed as Stargirl is interesting, and learning Dr. Mid-Nite's connection with the original gives him more resonance--but Dr. Fate fretting about something that might or might not happen? Mr. Terrific gaining what I felt to be a completely unnecessary reason to beat himself up that much more? Most of these stories felt like one-off "what can we add to this character" bits, with more emphasis on shock than substance, and I did wonder: what would this story have been like if, instead of six individual character issues, each plot was blended with the other throughout the whole series? If anything, it might have added some suspense, making the reader wait until the end to see how things turned out, instead of each chapter wrapping up tidily. I hate to say it, but here's a series that probably worked better as monthlies than as a trade shudder. I did like how the plots paralleled one another in the end -- Kendra's motherhood tied into her relationship with Dr. Fate most of all. And having Legacy be the Wizard at least redeemed what seemed to be a made-to-order villain, and there was a nice parallel in the legacies of the Justice and Injustice Society -- I hope Geoff Johns picks up on these aspects of the Wizard in his upcoming JLA run. And, both here and in JSA: Prince of Darkness, I enjoyed the realization among the older crowd of the JSA that it's not just about teaching the new dogs new tricks, but also about learning back and forth--and redeeming one another. It makes the JSA more a family than a schoolhouse, and I'm interested to see how that's tested in JSA: Black Reign. On to Superman/Batman now, and from there, we'll see. Could be some JLA, could be some Majestic, could be Fables ... we'll see. Dan DiDio and the "Wait-for-Traders"